The hi-line Plymouth Belvedere tiptoed into showrooms in 1953, as a subset of the Cranbrook line, and it returned in 1954 as a Plymouth’s stand-alone luxury car. The range included a four-door sedan, a two-door hardtop, a convertible, and oddly, a two-door Suburban station wagon. The standard engine was the venerable 217-cid, 100-hp L-head six-cylinder, and the base transmission was a three-speed stick. The semi-automatic Hy-Drive was offered for the last time this year, and the PowerFlite automatic was also optional. Prices hovered around $2,000. 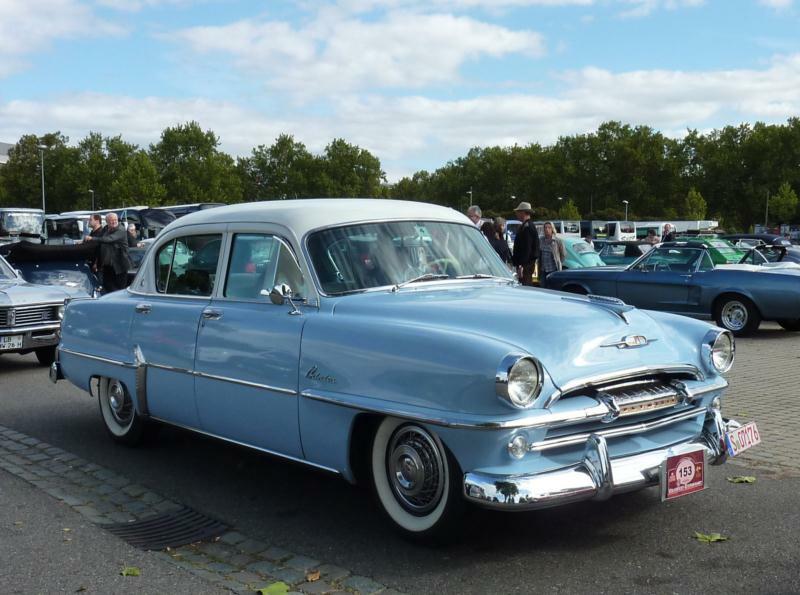 Plymouth redesigned its entire line for 1955, in parallel with the very successful Chrysler, DeSoto and Dodge “forward look” revisions. Sales soared to 670,000 units and the Belvedere notched up 275,000 sales, adding a four-door Suburban wagon and two-door sedan. The cars were longer, lower and sleeker (so much longer that production lines had to be extended 67 feet), and a new 167-hp, 259-cid V-8 was made standard on the convertible Belvedere (and optional on the other bodies) as the most powerful base V-8 offered by any manufacturer. The slab-sided body was brightened up significantly by side trim and two-tone paint schemes that divided the cars. The 1956 model year saw Plymouth introduce a four-door Belvedere hardtop as well as 12-volt electrics. The 230-cid, 125-hp six was still offered, but it was joined by the 268-cid and 276-cid V-8. The year 1957 was greeted with “Suddenly it’s 1960” as a slogan, and Plymouths were wildly redesigned to be even lower, longer, and wider, with big fins, curved glass, and four headlights. Little was changed for 1958, except the position of the side-flashes on the cars. Bendix fuel injection was also fitted to the 350-cid, 305-hp “Golden Commando” V-8, but it proved to be troublesome, and all were recalled in order to retrofit two four-barrel carburetors. The Belvedere’s base V-8 this year had numbers of 317-cid and 225 hp. The year 1959 saw Plymouths gain a “mouth organ” grille, swiveling bucket seats, and a “bird bath” pressed-steel spare wheel outline on the trunk. For 1960 Plymouth assumed its most outrageous style yet, with an exaggerated eyebrow sweeping over the headlight to a dogleg behind the front wheel. The fins were now restricted to a sharp upward curve further back on the rear fenders. The Belvedere was now Plymouth’s mid-range series with model numbers sharply reduced. Plymouth shed its fins in 1961, but the “flatfish” design did not move the sales needle and Belvedere sales reached their lowest number of this generation. sales skidded again, to 198,444 units. Belvedere sales totaled only 67,980, between two sedans, one two-door hardtop and two Suburban wagons. Plymouth Belvederes of this era are enormous cars that visually stand out. The 1955 and 1956 models have slightly conservative styling but are quite smart performers when equipped with the V-8. The larger 1957-60 cars in particular have struggled with rust problems, and solid ones are hard to find outside the desert states. They do embody iconic 1950s styling, though, so are worth seeking for that reason. The wide range of different trim styles for the Belvedere can make some pieces quite hard to find, so be aware of this fact prior to purchase.